As the Arctic melts – who has the most formidable ice-going naval fleet? As Arctic Sea-ice levels continue to diminish, the increasingly ice-free waters offer the promise of new trade routes and previously untapped mineral wealth. They may also be about to define new roles for some of the world's navies. Dr Gareth Evans reports. More than 7,000 personnel and 20 vessels took part, including the nuclear-powered 'Peter the Great'. Within hours of being sworn in as President, Vladimir Putin launched a programme to enhance and develop Russia's naval presence in the Arctic. The USCGC 'Healy' escorts the Russian-flagged tanker vessel 'Renda' 250 miles south of Nome, Alaska, in January 2012. Support and rescue capability will be an essential part of operations in the Arctic. Map of the Arctic Ocean; many nations have interests in the High North. The Coast Guard represent the US's leading service in Arctic waters. The Seawolf-class attack submarine 'USS Connecticut' surfaces through Arctic ice during 'Ice Exercise 2011'. America's submarine fleet is a major asset, but the US Navy lacks ice-capable surface vessels. Reducing on average by just over 11% a decade, according to US National Snow and Ice Data Center, receding arctic ice offers huge reserves of oil, manganese, copper, cobalt, zinc and gold, untouched fisheries and a potential polar sea-lane that could halve the voyage-time between Europe and Asia. Basically, the High North is a place of growing strategic importance. "In such a hostile operating environment, warships are not the only way to make an effective national statement." While a race to claim the arctic is unlikely, even so, to herald a sudden return to ‘gunboat diplomacy’ or the massed northern deployment of capital ships in a display of prestige and power. As Norwegian Institute for Defence Studies’ research fellow Amund Lundesgaard points out: "No navies have ice capable combat ships, and as far as I know, there are no plans to build such ships either. Consequently, naval presence in the arctic will be seasonal for decades to come." However, in such a hostile operating environment, warships are not the only way to make an effective national statement. "Power projection in the Arctic won’t be about battle-groups and weapons systems, it’ll be about support and rescue," says defence blogger Newton Hunter. "Sure, you’ll see battleships zipping in an out during the ice-free times for show, but it’s the ice-going capability of the non-combatant fleets that gives you a pretty clear idea of how stakeholders see the future strategic importance of the region. Who’s up on the game, and who needs to play catch-up." Russia is one nation clearly embracing the challenge. The region was declared a major strategic interest in the "National Security Strategy of the Russian Federation until 2020" and with Arctic naval capabilities prioritised by President Putin himself, Moscow has started a major programme of investment in both submarines and ice-breakers to back it up. "Moscow has started a major programme of investment in both submarines and ice-breakers to back it up." State-owned Rosatomflot already runs the only nuclear-powered ice-breakers in the world, but that existing fleet is soon to be bolstered, most notably by the addition of the first of the next-generation LK-60 Class. At 173m (568ft) long and 34m (112ft) wide, it will be 14 metres longer and four metres broader than current ships, and capable of powering its way through around three metres of ice, driven by its two ‘RITM-200’ compact pressurized water reactors. With a RUB 37bn ($1.1 bn) budget, construction is scheduled to begin next year, and the vessel will enter service in 2017. In the interim, the Coast Guard will receive new ice-class patrol ships, while Moscow continues to emphasise its ambitions with annual Northern Fleet exercises in the Kara Sea, this year involving more than 7,000 personnel and 20 vessels, including the 250-metre nuclear-powered flag ship, ‘Peter the Great’. US: ill-equipped and "inadequately prepared"
Washington has, at least until recently, viewed things rather differently, as a 2012 report from the Center for Strategic and International Studies makes clear. "A New Security Architecture for the Arctic; An American Perspective" describes a US approach that "has largely been to outsource any requirements to foreign-flagged commercial vessels or borrow ice-strengthened vessels from Canada, Russia or Sweden." "A 2011 war game simulation highlighted just how ill-equipped the world’s foremost naval power seemed to be." The nuclear submarine fleet obviously remains a major asset, but the navy seems distinctly wanting in terms of surface ships, having signed over its last ice-breaker to the US Coast Guard in 1966. 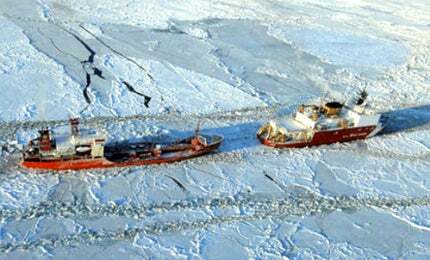 The Coast Guard itself currently has only one operational ice-breaker, the medium-sized ‘Healy’. By the start of 2013, ‘Healy’ will be joined by a heavy ice-breaker – returning to service after repairs and upgrades – and work on the design of a new heavy vessel is underway, with the contract expected to be awarded within five years. Northern Edge exercises every two years in the Gulf of Alaska aside, US vessels rarely venture into Arctic waters – and that lack of capability is now sounding alarm bells, particularly after a 2011 war game simulation highlighted just how ill-equipped the world’s foremost naval power seemed to be. A summary from the Naval War College revealed that the US Navy’s lack of ice-capable ships, support facilities and adequate communications left it "inadequately prepared to conduct sustained maritime operations in the Arctic." Nevertheless, according to Lundesgaard: "The US Navy does not seem overly concerned about a military build-up in the area. The US Navy has made no great efforts at increasing its presence in the area, and I have seen no evidence to suggest that this will change anytime soon." Canada, like Russia, affords the Arctic a high priority, with its policy for the region focussed on the four stated goals of sovereignty, social and economic development, governance and environmental protection. In practical terms, this translates into a major programme of investment in modernising the Canadian Navy and Coast Guard and revitalising the fleet – including allocating around $33bn across 30 years to build 28 new vessels. Between six and eight Arctic patrol ships and a new ice-breaker will be included in the project, bolstering the country’s existing ice-going capabilities. According to Foreign Minister Jonas Gahr Støre: "The High North is the most important strategic priority in Norwegian foreign policy" – and Oslo has allocated the resources and increased the military presence in the region to back up his words. Arguably the most high-profile example of this is the annual visit by at least one of the navy’s largest vessels – this year, its most modern warship, ‘KNM Thor Heyerdahl’ – to the territorial waters around Svalbard and Bear Island, intentionally to demonstrate Norwegian sovereignty in the area. The last of five frigates built between 2006 and 2010, at a cost of NOK 21bn ($3.7bn), the vessel and its sister-ships represented the largest investment in Norwegian defence to date, and maintaining dominion in the High North is said to have played a large part in the procurement decision. "It’s a different kind of ‘Cold War’ this time,and so far, Russia’s winning." 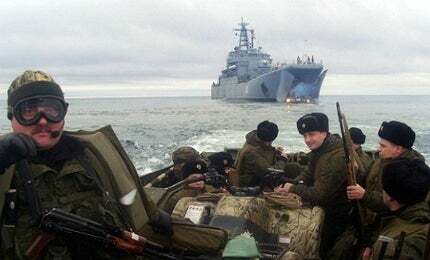 The military build-up has fuelled some media speculation about the prospect of international conflict, particularly after Russia famously planted a flag on the seabed in 2007, but Hunter sees it as nothing more sinister than the Arctic nations keeping an eye on their newly open waters. Lundesgaard agrees. Three years ago, he reasoned that the potential for an armed conflict in the region was "rather limited", principally because there is little actual dispute over resource ownership and he still holds that opinion today. He points to the historic agreement between Norway and Russia in September 2010, which settled a longstanding maritime boundary dispute to the satisfaction of both countries. "It shows that Russia is willing to settle disagreements peacefully." That willingness is, of course, backed up by Moscow’s impressive ice-capable fleet. "It’s a different kind of ‘Cold War’ this time," Hunter says, "and so far, Russia’s winning." In January 2012, Iran threatened to close the Strait of Hormuz if Western sanctions blocked its oil exports. Atomflot’s expanding nuclear icebreaker fleet brings with it a number of industrial and geopolitical implications, including a possible boost for Russia’s coal exports.